Remember that the merge fields will only work for contacts in your CRM who have the information being requested. If a contact does not have the information, the tag will be replaced with a blank space. For example, if a client record doesn’t have its last name completed you will see “ ” instead of a last name. Also note that the merge fields will not work for test emails, so when previewing your emails, seeing a tag like ~firstname~ is completely normal and will be replaced when the email is actually sent from DSS. In DSS, the “Digital File Delivery Methods” option has been moved from the Offer Edit page to the Offer Thank You page, and the options have been reduced to only providing a file attachment. But where are the download options? Good question. 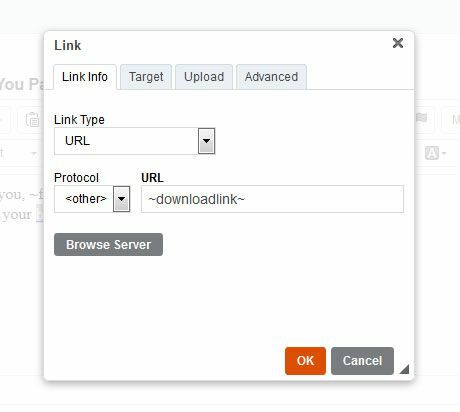 If an offer had previously been set to provide a download link in the follow-up email or on the thank-you page, a default link has now been populated into the content for each respective section. The link is also available via the Merge Tag dropdown mentioned above; with one click, you have a link to “Download This Offer.” The text and the link are completely editable, but there are a few things to keep in mind. For this feature to function correctly, you must have the offer uploaded to DSS. This should be done during the initial setup for the offer.